WORKSHOP 2. Parish and parish church. - The website of the heritage knights! WORKSHOP 2. Parish and parish church. The local parish church has nearly fallen down many times but people have built it up again and improved it. 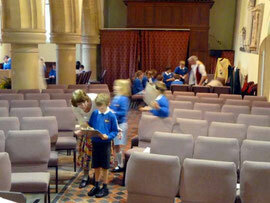 Scroll down the page to the Background Notes to discover more about St. James' Church. To help detectives discover more about the Parish Church building, how it has changed over the centuries and how old it is. Clip boards, view finder sheets, old photos, plastic covers and pencils. Heritage Detectives are able to use an old photograph to identify what is different and what is the same. They can use a timeline to locate information in time. THE QUEST. To discover if Arthur would recognise this church. 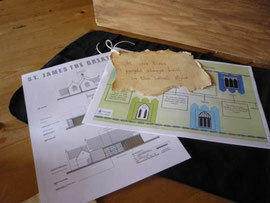 A stack of pictures of church buildings in an envelope with a note on “ which one is St James’ Church Norton and how old is it? An architectural drawing of latest build. Also in the treasures box Merlin’s notes and discoveries about the windows he has seen over the centuries. He has made a timeline of window shapes. Which of these old photos show Norton Church? 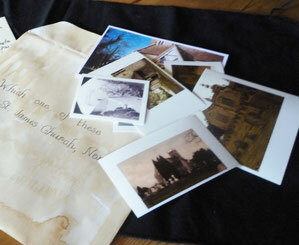 Which of this stack of pictures is St James' Church Norton? The detectives are not sure. Each couple takes a picture of a church, puts it on their Viewfinder sheet and goes outside to see if their picutre is Norton church. One couple finds that the picture is of Norton church but even then there is a question mark because the picture does not quite tally with what they can see with their eyes. Why? To find the answer the detectives look for more clues. They look again at some of the other material from the Treasures Box and discover that the extension has been built very recently. They also find that the church has been repaired and rebuilt many times, so it is old but how old? A timeline for window shapes! To find the answer the detectives look for more clues. They look again at some of the other material from the Treasures Box and discover that the extension has been built very recently, They also find that the church has been repaired and rebuilt many times, so it is old but how old? Then they find the window timeline and off they go again looking at the shape of windows. This time they find one very old window but it is inside the building why? They discover what this means and begin to work out the age of the building. The church has nearly fallen down several times but people have always found the money to restore it. How do you know? 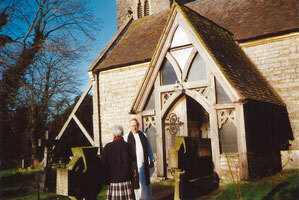 A Parish Church sits in an ecclesiastical parish. Norton Parish Church has been in a parlous state many time but the people of the parish have built it up again and improved it.